Confirmation is the completion of the process of initiation into the family of Christ and is preceded by Baptism and the Holy Eucharist. It is one of the 7 Sacraments of Catholicism. 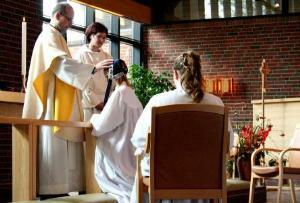 Confirmation involves being responsible for one’s faith and actions and is a coming-of-age ceremony. Performed by the Bishop, the confirmation rituals involve laying on of hands as well as anointing with holy oils. In addition, the person chooses a new name which is generally the name of a saint and is added to the Christian name after being confirmed by the Bishop. Confirmation is first celebrated by the parish at the Easter Vigil (the night before Easter Sunday) for the people involved in the RCIA and also celebrated at one Mass during the year for students enrolled in Religious Education. Classes start in September. Please contact the parish office at (561) 842-1224) for more information.